Last week as part of the reader's choice week I discussed scab hair. I followed this up with a poll asking whether or not you had experienced scab hair. Thank you to the 152 participants. The poll was intended to be a blind study. I really wanted to test the theory if people with scab hair relate it to having relaxer burns. The overwhelming answer is yes. Of the 85 people who said they had scab hair, 81 of them also reported relaxer burns (95%). Reader B suggested that scab hair could arise from hair growing out of a chemically damaged follicle. This may arise if the scalp was burnt by the relaxer. Not directly. Normally the reports are of hair loss (alopecia) related to the scalp burn. I have not found evidence of continued hair growth in an abnormal manner which the theory would suggest. 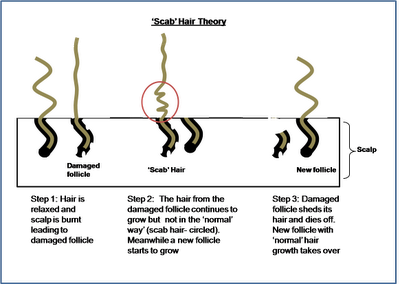 However the theory of a damaged follicle producing a damaged hair shaft for a while until it gets to its shedding phase is a real possibility (See the diagram, click to enlarge it). The shedding phase could be induced early as a result of the damage or the hair could keep growing for its full growth phase (as long as 2-5 years). Can you really identify scab hair so easily? 1. No, many people have been relaxed for so long that they really do not know what their 'normal' curl pattern really is. My advice, wait it out. Appreciate the fact that your hair is still growing on your scalp. Be extra gentle with it . Could 89 people really be wrong? I don't think so, some scientific studies take into account as few as 1-2 indiviuals. I am convinced scab hair is very much real for some of us. So the damaged hair folicle is permanent? Does that mean that the hair that keeps growing from the damageg hair shaft will always be scab hair (until it sheds off)? This is a real bummer. My scab hair area grows very very slow. Permanent in the sense that it will be there until its natural cycle ends. The normal growth cycle is around 2-5 years and then followed by a short resting phase. After this point the hair (follicle and all) sheds off (that is why shed hair has a little bulb). A new hair then starts to grow in its place (usually there is some overlap in the process otherwise we would all go bald). If B's theory is correct then it would be the cases that scab hair could potentially persist for years. My friend is newly natural and not into all of the online hair communities, but she was describing what sounded like scab hair the other day. She said she straightened her hair after the BC and there was a rough patch near her ends that she couldn't even get the comb through. Needless to say, she chopped it off. Thanks for the info Jc, I am one of your "secret" relaxed readers :) and I agree that scab hair does exist or at least chemically damaged follicles change the hair strand. I stretch my relaxers to 12 or 14 weeks and the crazy patterns of some of my new growth sometimes makes me wonder what the heck is going on in there lol. Actually your drawing is a very accurate representation. On more than one occasion I've found shed hair with new growth that is completely zig-zag and looks mis-shapen, without the defined curl of my other shed strands. This was very interesting indeed. lol Not so secret MrsT. My diagram is just an illustration conjured up from my mind. Zig zag hair does exist in normal natural hair and could even be your natural hair pattern, however it equally could be damage. Please God forgive me for treating what you gave me so abundantly beautiful, so badly. Thank you for showing me now, what I did wrong and giving me boldness to do right once more. Now, God give grace to all my efforts and give me a hairy miracle, in Jesus' name, I pray! I know this post is old but I'm so glad I found it. I have a few spots on my head, maybe 10% of my head, that has sprouted seriously dry, brittle and wiry hair during my six month transition that has no resemblance to the 3c/4a mix of the other 90% of my hair. These are the exact spots in which I had recurring scabs and eventually the hair loss that finally convinced me to give up relaxers. So glad to know what's going on in those spots! HOPE people are still reading this. I switched to Mizani and it burnt my scalp. I have no scabs but my scalp was burning for 6 weeks, its getting better now but the hair in the front isn't growing like the hair in the back. I have an appt to derm in 3 weeks,earliest appt. I am worried that my hair in the front isn't going to grow out like the back and that I will lose all my hair. I only scabbed once in decades of relaxer so I am at a loss as to why my scalp would burn so much, my hair is falling out and the front is not growing. Also, my hairline fell out a bit. I am mostly worried about the lack of new growth in the front of my head, the back is grown back normally. What do you ladies suggest? Also I'm curious if other 4b & 4c transitioners are also frustrated with the lack of videos and blogs that address this hair type. If you know of any blogs or videos please feel free to share them here. Thanks everyone. These are from the UK, but for a transitioning blog - LoveyourTresses and for a youtube - Fusion of Cultures (has chopped, but many old vids). That's two off the top of my head, but I'm sure there are more! Scab hair??? Been natural for 10 weeks, and discovered scab hair when I did the infamous BIG CHOP! The relaxer is cut off, but when my hair started growing very well, scab hair was still there? after week 4, the scab hair was visible on the ends only??? my natural hair finally came through!!! waiting on more growth before cutting the scab hair ends... the big chop cut 4 inches off... don't wannna go through another big chop to get the scab hair.. not this soon anyway...Take your time and take it EASY! I know you're wanting your hair to be the business and not a HOT MESS... the blessing is in the process... focus on a healthy scalp, natural oils, moisturizers, massages, etc... eventually, your hair will come forth!